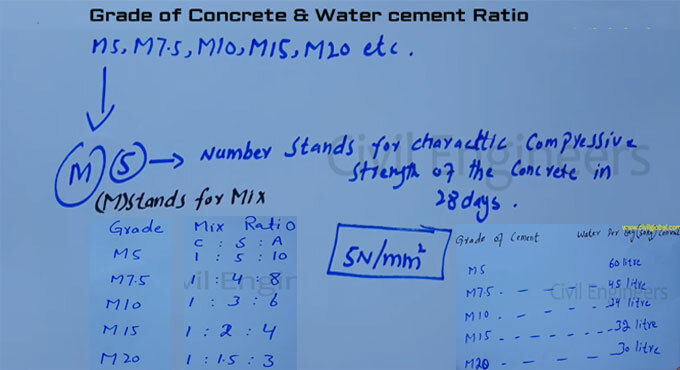 In this construction video tutorial, one can get details on different types of concrete grades as well as how much water is required for these grades like M5, M7.5, M15, M20, M25 etc.. Here M signifies concrete mix and the number signifies characteristic compressive strength of the concrete in 28 days. It is based on direct compressive test. So, If you utilize M5 concrete grade, the strength of concrete will be 5N/mm2. For 7.5 concrete grade, the strength of concrete will be 7.5N/mm2. It will be applicable for other grades of concrete. (N means newton). To find out the quantity of water in concrete mix, the following formula is used. To get more information, watch the following video tutorial presented by the renowned engineer Sami Ullah.